As a father of a 13-month old, I’m always looking for new children’s apps that she’ll be interested in now and ones that she might have interest in years from now. It’s actually the reason I wrote, illustrated, and programmed the Colin Turtle children’s book series. 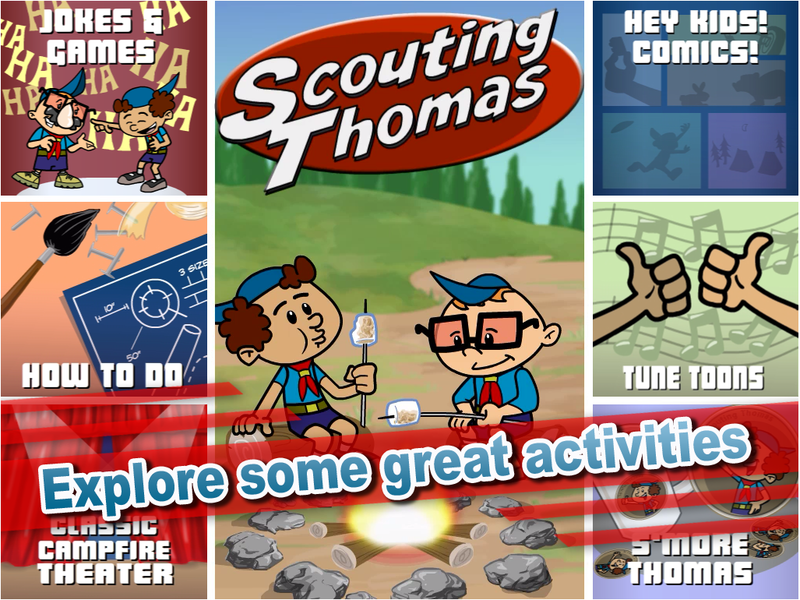 I recently stumbled across a new app called “Scouting Thomas” through social media and I was instantly interested by the great artwork style. Opening the app, I was immediately impressed by the well-animated intro sequence of Thomas and Buddy roasting marshmallows. I tapped on the animation, and Buddy’s marshmallow burst into flames and Thomas quickly put out the flames using a fire extinguisher. It was cute, funny, and being an animator and app developer myself, I was impressed that there was such fluid animation on a splash screen of an app. The next screen I visited was the Jokes & Game page. Here you can tap on Buddy and watch him tell kid-friendly jokes to Thomas. The jokes are a bit corny and might be slightly too sophisticated for very young children, but I think kids in the demographic that Flying Monkey Pie Productions are aiming for, will enjoy the humor. The games screen offers a crossword, Scrabble-like game where users can solve questions by jumbling supplied letters. Here I was impressed that the app offered a game, a joke screen and an introduction animation without making the app running the least bit slowly on my iPad. The only qualms I had thus far were that the kids didn’t speak, you have to read everything yourself, and the controls to the game were a bit clunky. While moving letters around to solve a puzzle, you had to make sure that there wasn’t a letter in the space to where you wanted to move it, otherwise the letters would overlap in the same space. I would have liked to see the letters shift down one space to make puzzle-solving quicker and easier. One part I did enjoy was that after reading all of Buddy’s jokes, you get rewarded with a scout badge. Throughout the app, you can earn different badges for completing various tasks. I think kids would enjoy being rewarded for going through each part of the application and performing different actions. Next, I visited the how-to section. This section is an interactive portion that shows you how to make a contraption that shoots out marshmallows. 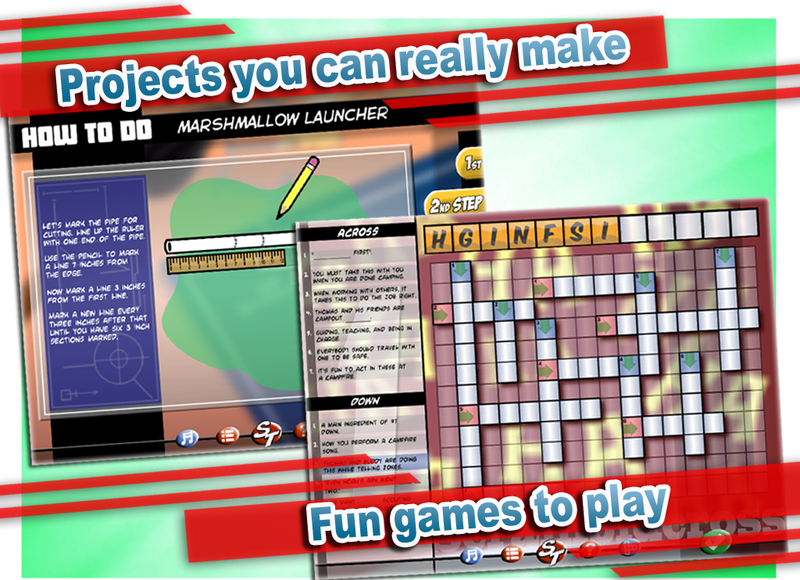 You drag the parts on the screen connecting them, and when you’re done, you know how to make your own marshmallow shooter. You also earn another scout badge for completing the contraption in the app. I didn’t have the parts needed, so I did not get to test out actually making the marshmallow shooter. Could be a fun weekend project when my daughter is loder though. There is also a theater section where you can watch a short animated film. I was really impressed by this because the animation is fluid and the frame-rate never dropped. I was probably more impressed by the theater than most people would be that purchase the app, but it’s probably because I know how difficult it can be to make a great animation and also have it play well on a mobile device. There is a comic book section as well, where you can tap on each panel of a comic strip and have the speech balloons appear. This is where I would have really liked to hear the kids actually speaking, but I’m well-aware of the costs of professional voice actors, so I wasn’t terribly surprised by the lack of kids’ voices. Still, I think it’s what could have taken this app from being great to being a fantastic experience. Overall, I am still amazed by how much the creators were able to fit into a single mobile app and not only that, to keep the quality of the work so high. Kids will love this app because of all of the different activities, and adults will be surprised by the high level of quality that the app displays. Pick this app up if you’ve got little ones and want to keep them entertained.